Humans are naturally drawn to watching animals, it's one of the reasons why we have zoos, aquariums and sanctuaries exist, unfortunately that curiosity is leading ot widespread abuse of many animals around the world thanks to wildlife tourism. As a kid growing up in South Africa a trip into the wilderness was life-changing. Family vacations were spent on Safari and seeing animals in their natural environments touch my heart and soul deeply. From an early age I understood the importance of nature and conservation. Nothing beats seeing an animal in the wild. Experiencing the beauty and majesty of wildlife firsthand makes your heart skip a beat. Wildlife tourism is worth up to $250 billion (USD) annually and its estimated that about 550,000 wild animals are kept in wildlife attractions around the world and 110 million people visit cruel wildlife attraction as tourists each year, unaware of the cruelty that goes on behind the scenes. World Tourism Day is the perfect time to recognize the impact of tourism on social, cultural, political and economic issues as well as the issues it raises in terms of the conservation and animal welfare impacts. Elephant riding is popular in Thailand and the activity is spreading across Africa. In order for an elephant to accept a rider it endures a cruel training program called the "crush" using pain, fear and isolation. The trauma cased from this process can stay with the elephants their entire lives. Lion and tiger cubs used for selfies with tourists are taken from their mothers at an early age and typically kept in isolation. Many animals like monkeys are forced to do unnatural things through painful training methods and when not performing are usually kept in small barren cages. Even if the trinkets didn't come from endangered species, there was likely still cruelty involved but at risk species like sea turtles are especial vulnerable to poaching and commercial exploitation. For sea turtles, every part of their bodies are desirable from their eggs and meat to their shells. Safaris and whale-watching trips can be amazing experiences and can be run humanely and sustainably. Look for companies that have animal protection policies and reviews. Make sure they keep an appropriate distance from wildlife. Wild animals belong in the wild and we are all responsible for doing our part to protect them. For more tips and suggestions look to groups including World Animal Protection who are a great resource for travellers. 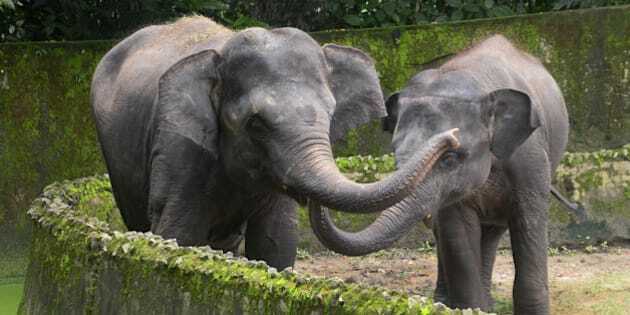 World Animal Protection has been working with travel companies all over the globe to improve animal welfare policies and more than 100 travel companies have signed on to their Elephant Friendly Travel pledge.